Hurricane Irma will have negative implications for the Puerto Rico Electric Power Authority’s liquidity and cause further delays to its debt restructuring plans, Moody’s Investors Services predicted in a report released Tuesday. Last week, Puerto Rico’s northern coast was sideswiped by Hurricane Irma, a Category 5 storm that caused widespread power outages, including damage to core electric infrastructure. “We understand that Irma did not cause severe damage to power plants owned by the island’s utility, but it did cause damage to the transmission lines across the island, resulting in the power outages,” said Moody’s, which has given the public corporation a Ca negative rating. 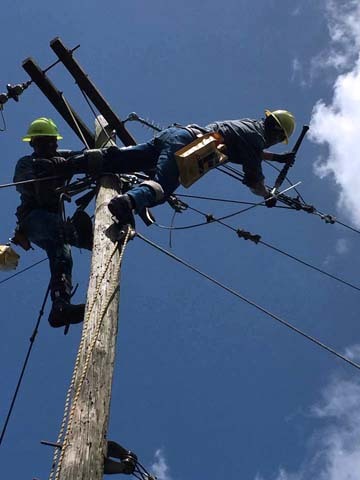 As soon as the storm passed late last week, PREPA crews started working round-the-clock to restore service, which has been difficult in areas where the hurricane knocked down trees and utility poles that took power lines with them. On Tuesday, Gov. Ricardo Rosselló said the losses associated with Hurricane Irma reach about $600 million, a figure that likely includes PREPA’s damages. “The business disruption and costs, which will be material plus the lost revenue stemming from the outages, are credit negative for PREPA,” Moody’s said. “Moreover, PREPA’s liquidity, which consists only of internal cash, will weaken as it attempts to meet the extensive operating and capital expenses needed to restore power to the island, while losing revenue collection for the period of the outage,” the agency added. While some of these costs may be recovered through insurance claims or from Federal Energy Management Agency funding, liquidity will decline in the interim, as the utility will need to initially fund such costs prior to receipt of any claims, the credit agency noted. “PREPA’s internal liquidity is arguably at a higher level today than in the recent past owing to the approximately $400 million payment default that occurred on July 3, due to the lack of sufficient funds to make the payment, which preserved cash and increased its internal liquidity,” Moody’s noted. PREPA has been operating under Title III of the Puerto Rico Oversight, Management, and Economic Stability Act since July 2, “owing to its chronically weak financial performance, a struggling economy and the need to invest considerable capital in PREPA’s infrastructure improvements,” Moody’s concluded. Hey Buddy!, I found this information for you: "Moody’s: Hurricane Irma further cripples PREPA". Here is the website link: https://newsismybusiness.com/hurricane-further-cripples/. Thank you.